George Kranky created his own Marvellous Medicine to deal with his grizzly old grunion of a Grandma. You definitely can't do that at home (so don't even try! ), but here's some amazing science that you can do!From concocting home-made slime to creating your own volcano, these fun experiments are all easily done, following simple step-by-step instructions and using everyday household objects. 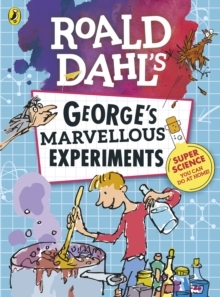 Inspired by Roald Dahl's terrific tale, this is the book for budding young scientists everywhere!